Did that just happen? Seriously. The Colts had no business winning this game. They were outclassed in every possible statistical category. They couldn't protect The Franchise. No one could catch a friggin' football. Andrew Luck completed 3 of 12 passes for 56 yards and zero third down conversions in the first half. The Colts couldn't even manage to get a turnover (and the one they did get got inexplicably taken away). Yet, they stayed the course and somehow managed to turn things around in the second half. Not so special teams. Ick. The Colts were terrible here, especially in the first half. The Texans blocked an Adam Vinatieri field goal. Pat McAfee mishandled a punt, scrambled around, and then made an astoundingly good punt. The Colts were subsequently flagged for having an ineligible man downfield. On the re-kick, McAfee got absolutely rocked, firing off an ineffective punt of 29 yards. They also picked up a false start before McAfee's final punt of the game. And then you have the Texans, who somehow had an even worse day. Kicker Randy Bullock missed three field goals, including a 55-yarder at the end that had absolutely no shot (it was Vanderjagtian in its complete and utter futility). On the Texans' final return of the day, a holding penalty negated a decent return, pushing them back to the 33-yard line. I should also mention a couple positive moments: Sergio Brown made a nice play to down a punt inside the five. McAfee, who was holder on the blocked kick, chased down the returner, showing again that he does more than just punt and tweet like a maniac. Other than the blocked FG, Vinatieri was solid and reliable. T.Y. Hilton had a nice punt return (34 yards) that led to the Colts' first score of the game. Even David Reed had a good kickoff return. Missing Reggie. Cris Collinsworth and Al Michaels repeated this storyline about 80,000 times, approximately 3,000 fewer times than they mentioned how much we all should love Case Keenum. Despite the snark, you could definitely tell Andrew Luck was uncomfortable without No. 87 out there. Actually, the whole offense was uncomfortable without Wayne. Guys were in the wrong spots, they couldn't catch anything, and Luck was off target. There was no rhythm and the Colts looked clueless. Case Keenum. I enjoyed watching Keenum play against the Chiefs last week. I would've enjoyed watching him this week if he'd played against any other team in the league. The kid's got some swagger. He makes plays and moves well in (and out) of the pocket. He's fearless, hard to sack, and has a knack for finding open receivers. Reminded me a bit of Russell Wilson out there, to be honest. He's yet to win an NFL game, however. Right now, I think the Texans ride him and see if he can get them some wins. They're certainly a much more exciting team with him out there, and if you're going to lose--which the Texans already were--you may as well lose in exciting fashion. Should someone cover Andre Johnson? Johnson had a gigantic game against the Colts, catching 9 passes for 229 yards and 3 TDs. He did most of his damage in the first half, getting open for two long touchdowns and adding a third late in the half. The way the Colts played, you would've thought they'd missed Johnson on the scouting report. On one play, Vontae Davis bit on an out and up; Johnson ran free. On another play, Antoine Bethea had him deep and seemed to lose track of the ball. On another TD, Davis had perfect coverage but mistimed his jump in the end zone. Key divisional win. The Colts needed this one to keep a little cushion against second-place Tennessee and stop the Texans from jumping back into the divisional race. While Houston dominated the first half, the Colts came alive in the second to steal a road divisional game. TY times three. T.Y. Hilton went off in the second half, catching three touchdown passes. He finished with 7 grabs for 121 yards. Luck targeted Hilton 12 times. What I like about him is that each of his TD catches came in a different way. His first was a nice corner route where he beat his man and made a nice catch. On the second one--his game-changing 58-yard score--Hilton outran the coverage and got deep. On the third TD, he slid out on a little route to the flat, made a guy miss, and then got into the end zone. Fleener's grab. A very, very big play was Coby Fleener's catch on a two-point conversion. Without that catch, the Colts only lead by a point. In that case, Bullock's inevitable missed field goal at the end would've missed for the win instead of the tie. But seriously, Fleener made a fantastic grab with two defenders on him. He got up and snatched it out of the air. He finished the game with 3 receptions for 64 yards. #GRIFFNATION still a developing nation. I love Griff Whalen. I think he can be great, but he was hardly that in his first extended play of the season. Luck targeted him 9 times; Whalen finished with 3 catches, including a couple drops. That said, he came up with a major-league-huge grab on 3rd and 10 on what ended up being the game-winning drive. Luck also missed a wide-open Griff on a wheel route in the second half. DHB MIA. If Darrius Heyward-Bey hopes to "replace" Reggie Wayne, he'd better start catching the ball. Collinsworth pointed out that DHB's skills and speed mean absolutely nothing if he has stone hands. He did draw a pass interference penalty that led to a field goal. So there's that. Just the Texans bein' the Texans. I hate to say it (actually I don't), but this was a typical Texans game. This franchise wants to step into the big leagues, but each time Houston gets the chance, it falls flat on its face. Good teams don't blow 21-3 halftime leads. Then again, I never said the Texans were a good team. While Keenum never pulled a Sage Rosenfels in this game, he didn't have to--Randy Bullock did that for him. "Let's check in with Michele Tafoya. What do you know?" "I don't know anything guys, but here's that video again of Gary Kubiak collapsing just in case you didn't see it during one of my previous seven non-updates. To repeat information you've already heard, Kubiak collapsed at halftime and went to an area hospital as a precautionary measure. To reiterate one more time, the Texans PR staff knows nothing. Hence, I know nothing and am telling you that I know nothing." "Thanks for the update, Michele. Our thoughts and prayers with Gary Kubiak..."
I just wish that, when people had nothing to report, they'd just report nothing. This isn't to say you don't mention what happened to Kubiak or reference it during the game, you absolutely have to. But to go back to the sideline reporter who knows nothing and act like it's an "update" is just stupid. The fake spike. I did like Keenum's decision to forgo the spike near the end of the half and loft it up for Andre Johnson instead. It was a heady, canny play and paid off big time. Richardson effective at points. The numbers weren't huge (and I'm starting to suspect they never will be, but maybe, just maybe this will work out). Still, he had a couple decent (and that's it: decent) runs and a huge catch that set up TY Hilton's third and final (game-winning) touchdown. I'd like to see the Colts work Richardson into the passing game a little more to get him some open field to work with. He's also usually pretty good in blitz pickups, although this wasn't his best game on that end. Colts: Blocked FG, punt, punt, punt, punt, FG, end of half. Texans: Touchdown, turnover on downs, touchdown, punt, missed FG, punt, touchdown. Colts: FG, touchdown, touchdown, touchdown, punt. Texans: FG, missed FG, punt, punt, missed FG/end of game. Going for it. I thought it was a mistake when Kubiak decided against a relatively easy field goal in favor of going for it on fourth and one on the Texans' second drive. The Texans should've gone for the points...but then again, maybe they didn't have confidence in their kicker (even though this was way before Bullock missed those field goals). 24-6. Third quarter. Think about it. The Colts trailed 21-3 at halftime and 24-6 late in the third quarter. Even after TY Hilton scored to make it 24-12, a comeback felt unlikely because the Colts struggled to find rhythm on offense. Then, after a stop and a quick strike to Hilton, we suddenly had a ballgame. Luck under fire. The Texans hit Luck 11 times and finished with 4 sacks. Indy had no answers in the first half for that pass rush. They finally went to a max protect scheme at times that gave No. 12 more protection. ...Put it in the defense's hands. The Colts defense was much better in the second half. They went to some more aggressive schemes and tried to put more pressure on Keenum. It worked. The Texans managed only 3 points in the second half after lighting up the Colts in quarters one and two. They mostly limited the big plays and harassed the young quarterback. Active Angerer. Pat Angerer nearly came up with a game-sealing interception, but it wasn't to be. Angerer also made a great tackle on Keenum in which the Colts outsmarted the Texans. Keenum ran several effective bootlegs off the team's stretch run game. On a key second and 8, Keenum faked a handoff, Robert Mathis crashed down from the outside, and Angerer went straight for Keenum, stopping him for a 3-yard loss. The resulting third and 11 play fell incomplete, and the Texans had to punt. Angerer led the team with 12 tackles. The fumble that wasn't. I still can't get over the reversal on the fumbled kickoff return. Is it possible that LaVon Brazill touched the ball while he was out of bounds? It's absolutely possible, even probable. Did I see any indisputable video evidence that warranted a reversal? Absolutely not. I saw a few instances of "maybe the ball hit his foot" or "maybe the ball hit his hand while he was out of bounds." I never saw anything that said, "Yep. He touched it. That should be Houston's ball." I'm obviously a Colts sympathizer, but I try to be fair. I didn't see anything on that replay that warranted a reversal. It should've stood as called (for what it's worth, Collinsworth said he thought the referee would confirm the ruling). Revenge of the Challenge. 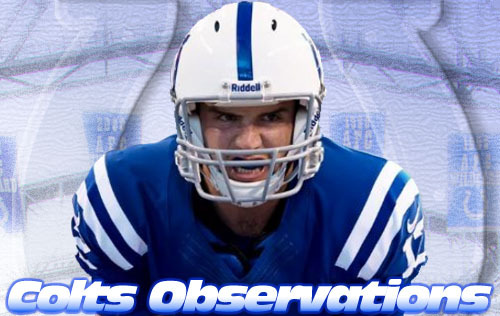 The Colts got a measure of revenge when Andre Johnson's catch was overturned on review in the fourth quarter. The Colts challenged that one (it happened right in front of their sideline). I really didn't see much and figured it would stand as called. Instead, the referee said Johnson didn't have control of the ball on the ground. Again, I didn't see much on the replay to warrant the reversal. All in all, it's a wash...with both calls hurting each team equally. The Texans scored a touchdown off the fumble reversal; the Colts scored a touchdown after the pass was ruled incomplete. Luck's second half. Let's end this on a good note...as Andrew Luck often does. After a terrible first half, Luck lit up the Texans in the second half, going 15-28 for 215 yards and 3 TDs while coming up with big play after big play (a 17-yard pass on third and 10 to Griff Whalen was a standout play). He finished 18-40 for 271 yards.